The Legendary Choice of Professionals was created in 1955 by Robert Carre and is the most popular professional clarinet in the world. Its tone is focused and rich, and it is powerful in all registers. Its flexibility lends itself to all repertoires: symphonies or chamber music, soloists, teachers, military bands, students or amateurs. 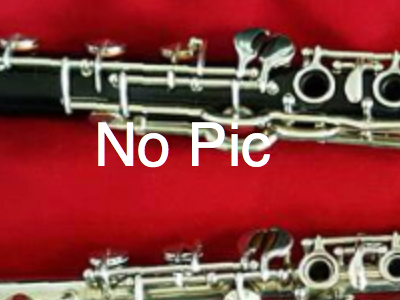 The Buffet Crampon R 13 Eb-clarinet is a professional clarinet and is one of the first poly cylindrical bored clarinets. It became the prototype of all modern clarinets and is now available in many different variations. Today, it is primarily marketed in the US, England and the far east. The upgraded altered versions, like the Tosca are now played by musicians all over the world and the most popular Eb. The R 13 is used by musicians off all musical styles and should be consider as professional as their more expensive upgrades despite its lower price tag. Both models are made in one piece. All of these models are considered small bore instruments and have in common, that their sound is dark, warm, focused and that they have a good projection. The sound color varies depending on the individual bore-shape-proportion. The narrow bore is also responsible for the higher resistance a player will feel, compared with wider bored instruments. See also Clarinet bores and sounds. The R 13 Eb is only available with silver-plated keys. The R 13, as well as the RC-models are available in African blackwood with black stained surface to give them an even look, independent from the original color of the different body parts. This has no influence on the sound. Alternatively are they also available in crack preventing Greenline material. For players, who prefer the original wood, but like a reduce risk of cracking, Lohff & Pfeiffer offer the tone hole crack prevention for all wooden instruments as an option. See also: LP Tone hole crack prevention. Attention! The R 13 is the only modern Buffet model, which never had a particular R 13 Logo. This can cause sometimes problems to determine which model it really is. Older E 11 models can easily be mistakenly categorized as R 13th after their Logo vanished, since it was only printed onto their body. If in doubt, check out the form of the left-hand e-B and C-F lever as well as the serial no. font. E 11 have a very tiny one compared to the much bigger R 13 font. The R 13 is not available with the left hand Eb/Ab lever, but we can add one. For additional options check out our option list at the bottom of this page. Used instrument will be delivered overhauled with all the high standards from Lohff & Pfeiffer. It returns from our workshop including all the special features coming with L&P Pro setup.